In today’s healthcare environment, organizations that create and maintain a culture of patient satisfaction and service excellence are positioned to excel. Those that do not, open themselves up to failure, and potentially costly litigation. 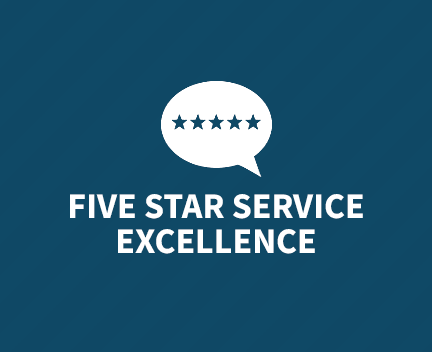 The SE Healthcare team practices five-star excellence, and we will work with you to ensure that your organization achieves five-star excellence as well. It’s always been a part of our culture, and the feedback we receive from our clients lets us know we’re doing things the right way. Your organization can too with our guidance. Let us create an atmosphere within your organization that allows you and your team to excel and rise to the top. SE Healthcare’s team of healthcare experts and thought leaders will provide you with a customized risk engineering program. This program will be designed just for your organization, and it will assist you in making the transition to creating a positive culture to reduce risk and become a Five-Star Organization. We will work with your team to conduct an analysis of your organization focused on uncovering existing factors within your operations that could lead to potential claims. By developing a strong understanding of the current culture surrounding your organization’s risk management performance, the SE Healthcare team helps you create a plan aimed at driving improvement. For your organization to fully embrace the concept of Five-Star Excellence, your team needs to develop a strong understanding of the value and what it truly means to be five-star. To help you in your quest to get your team members on the same page, SE will orchestrate training and educational programs targeted to your specific needs to improve the safety and quality of your service. We offer a full complement of risk management educational programs. SE Healthcare will provide you with the appropriate tools, strategies, and documentation procedures necessary to create and maintain a five-star environment. These tools will help improve your team’s performance and allow your organization to better involve patients in their own care. Achieving Five-Star Excellence begins with a solid commitment from senior management and involves everyone within your organization. Each clinician and support staff member will learn to contribute to quality healthcare service in a manner that is safe, efficient, and competent. We will work with you and your team to create a friendly, warm, and respectful experience for your patients. SE Healthcare’s processes will help you achieve your goals by achieving buy-in from your entire team and working to unite them to drive toward a common goal.